Over the past few days, I have been asked my age three times, held a Haredi woman’s baby on the tram (not the first time either I have been asked to play temporary babysitter in Jerusalem), discussed with a cab driver how being Shomer Shabbat affected his career as a policeman and had a waitress compliment my friend’s glasses, ask her where she got them and how much they cost. "Behavior of the natives" and "customs of the land" are constantly discussed by new olim. Just the other day, I talked about the differences of manners in Europe, America and Israel with one of my French roommates. All this begs the question, what exactly are manners in this Jerusalem-stone jungle I find myself in? What are the rules of the game? From what I gather, apparently it is not rude to ask someone's age and it is dumb to the point of being offensive to wait in line patiently. For some, Israel has a wild sort of atmosphere. Personal space is metaphorically and literally invaded. People push and don’t say “excuse me” unlike in New York where people push, say “excuse me” and then continue to push. Sometimes it feels like everything is a fight. At the bank, I am constantly begging to get any information about my account, am offered water when I show up sweaty (it’s a 15 min walk uphill under the hot Middle Eastern sun) and am obliged to listen to my bank teller lament about it being too hot outside for her party that is set to take place in just a few hours. Other times I am told (not asked) to put money into a savings account even though the majority of Israelis are in the red zone. And yet today, my bank teller was really helpful, above and beyond, when I asked her for help as an olah chadasha, even calling up VISA when I had a question about a charge and offering to get it cancelled for me. As much as I genuinely love the impersonal smiles Bank of America, you don’t get that type of help outside of Israel. (Definitively a new spin on the Israel-Germany relationship for those who claim Israeli exists only as consequence of the Holocaust. But I digress…). And sometimes it’s true—sometimes I would prefer it if the fruit vendor at the shuk didn’t make fun of me or my bank teller just smiled at me dully. And yet, perhaps because so many normal boundaries blur here, Israel almost feels like a socialist utopia where anything could happen. Israelis can be blunt, rude, aggressive. But after living here for about a year, I have toughened up and learned how to react. And, on the flip side, Israelis can be the most generous, genuine, open-minded and helpful people anywhere. In fact, I have even seen Israelis yelling (being blunt, rude, aggressive) when someone didn't give up his seat on the tram for a pregnant woman. 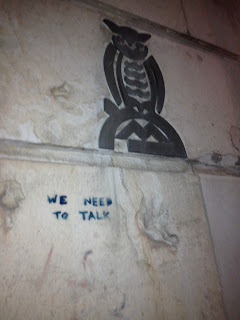 In Jerusalem, you aren’t afraid of talking to other people, of asking for help, of looking at someone else in the eye. Kids play in the streets unsupervised. If you are a 50 agurot short it is ok. There is a certain spontaneity in everyday life here, freedom in knowing that no matter what people will care if something really bad happens, that you can always find a ride or someone’s phone to borrow if yours dies. Someone will even be there to take care of your child should you need to pop open the stroller on a crowded tramcar.